There's Gold In Them Thar Sewage Pipes, Swiss Researchers Say : The Two-Way Each year, more than $3 million in gold and silver winds up in Swiss wastewater, scientists found. But in most cases, it doesn't make economic sense to extract and recycle the metals. 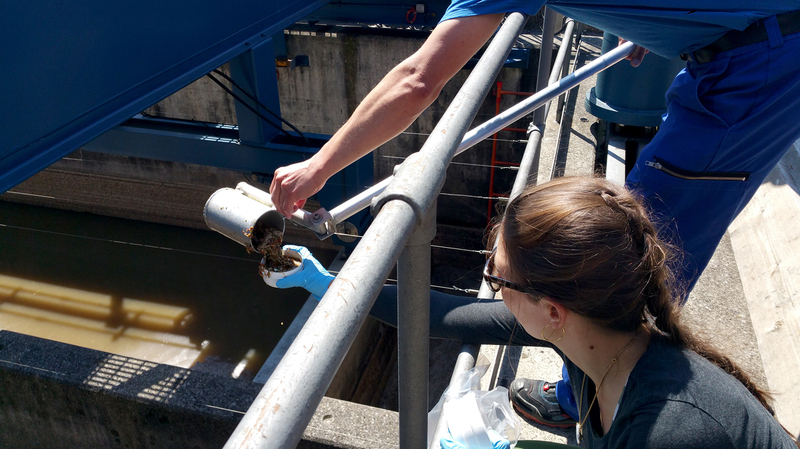 Researchers collect a sample at the Werdhölzli wastewater treatment plant in Zurich, as part of an Eawag research project exploring the concentration of various metals in treated wastewater. In Ticino, Switzerland, the streets aren't paved with gold. But the sewage pipes are packed with it. And across the country as a whole, some $3 million worth of gold and silver is thrown out in wastewater every year. That is according to Swiss researchers who evaluated 64 municipal wastewater treatment plants across the country. Scientists have long known that small amounts of the valuable metals can wind up mixed in with sewage. In Switzerland, the researchers found, the small quantities add up — to more than 6,600 pounds of silver and nearly 100 pounds of gold, the researchers estimate. In most cases, it would be so expensive to extract and recycle that it wouldn't make economic sense — recovery would be "scarcely worthwhile," as the researchers put it. But the concentrations of metals varied across the country. And in Ticino — where a number of gold refineries are located — there's an unusually high amount of gold passing through treatment plants. In some sites, "concentrations of gold in sewage sludge are sufficiently high for recovery to be potentially worthwhile," the scientists say. Bloomberg notes that Switzerland is a "major gold-refining hub," with about 70 percent of the world's gold, on average, passing through Swiss refineries each year. In addition to the precious metals, the researchers also looked at concentrations of various elements that are useful in electronics and luminous paints. They evaluated any potential environmental hazards, finding that in the "vast majority" of cases, there was no known risk to the environment from the concentration of the metals. It's not news that valuable metals get mixed in with human waste. But the study, commissioned by the Swiss government and carried out by the water research institute Eawag, was described by Eawag as "the first systematic, quantitative assessment" across an entire industrialized country. Related work has been carried out by the U.S. Geological Survey. The USGS has explored ways to remove potentially dangerous metals from treated sewage that is used as fertilizer and also pursued the possibility of extracting valuable metals from wastewater as a potentially profitable resource. In 2015, a group of researchers in the U.S. evaluated sewage sludge from 1 million people and found $13 million worth of metal in the waste. Meanwhile, the news of the untapped wealth in Swiss sewage might bring to mind another story we recently covered on The Two-Way — the tale of 500-euro banknotes mysteriously shoved down toilets in Geneva.